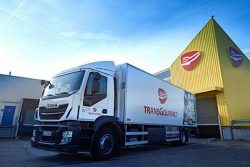 With the purchase of five Allison-equipped Compressed Natural Gas (CNG) vehicles, food wholesaler Transgourmet is making another step toward becoming the most sustainable company in the German food industry. Five new IVECO Stralis NP trucks will be used in the city of Ulm and surrounding areas. The food wholesaler is using methane-powered Stralis NP trucks equipped with Allison 3000 Series™ fully automatic transmissions in the course of a sustainable realignment of its fleet. According to Iveco, the vehicles can cover distances of up to 550 kilometers depending on the tank volume. With the typical Transgourmet route being around 200 kms they only have to be refueled once every second day, even though the cooling unit is also powered by the vehicle’s engine. Allison says its automatic transmissions are ideal for natural gas engines that have to endure the heavy start-stop duty cycles of urban distribution vehicles. Allison’s torque converter technology supports the natural gas engine during vehicle start-ability by smoothly multiplying the engine torque and delivering more power to the wheels. The helical gears of the Allison transmission help vehicles with natural gas engines to a quieter operation. Noise emissions of the IVECO Stralis NP are about 4 dBA lower than those of a comparable diesel truck. Already a reduction of the noise level by 3 dBA is perceived by the human ear as noise reduction by 50 percent. Thus, the natural gas vehicles are ideally suited for use in the city. The five CNG vehicles, four 18-ton Iveco Stralis NP type AD190S33/FP CNG 4×2 and one 26-ton Iveco Stralis NP type AD260S33Y/FS CNG 6×2, are equipped CURSOR 8 Euro 6 engines that delivers 243 kW (325 hp). These engines reduce particulate emissions by 95 percent, nitrogen oxides (NOx) by 60 percent, and CO2 emissions by up to 90 percent when using bio-methane. They achieve fuel savings of up to 15 percent compared to diesel trucks on the same route. Allison transmissions featuring FuelSense® 2.0, Allison’s latest fuel-saving technology, may achieve even greater fuel savings. FuelSense® 2.0 uses a real-time learning algorithm that automatically adjusts the transmission control to load, speed and topography to find the ideal balance of fuel consumption and performance.